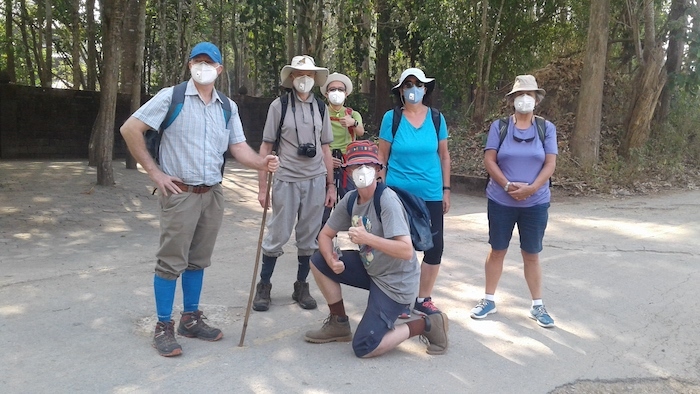 Although the pollution levels are declining there may still be considerable variation from one area to another and it is recommended that hikers bring a face mask. This is a relatively easy hike along the forested ridges of Mon Jaem with (weather permitting) views to the north (Doi Chiang Dao) and south (Doi Pui). 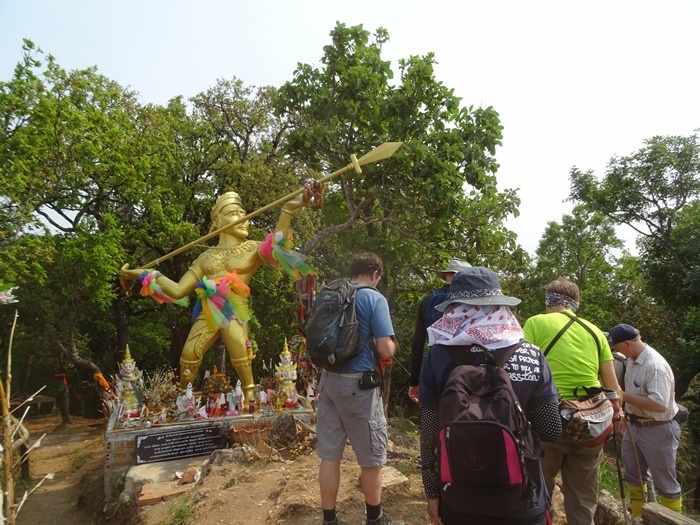 The hike will be entirely on dirt roads with lots of shade and with a couple of modest hills and one major viewing point (complete with golden statue of pre-Lanna King Wilangka). We will also meander through a small vineyard (no wine on sale, unfortunately) and through the small settlement of Mon Jaem towards the end of the hike. (Young-at-heart hikers will probably have the option of enjoying a box-cart ride down the long slope of dirt track just before the end point). The hike should take just three to three and a half hours and afterwards we will retire for lunch at Therma Doi restaurant. Meeting time: Sunday 7.45AM for an 8.00AM start. The car journey should take approx. 40 minutes. 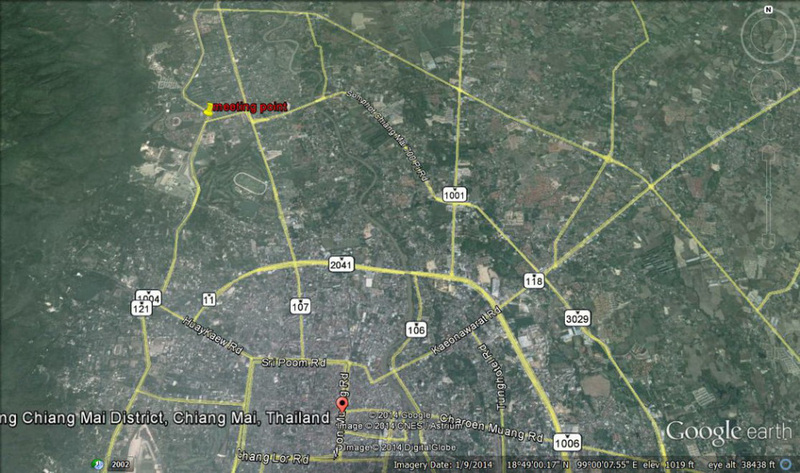 Meeting Point: The car park bordering on Canal Road in front of (but not inside) the 700-Year Stadium complex. If you want to come: Check that you have read the general conditions and advice on this website, as well at this particular post. If you still think the hike is for you, just turn up at the meeting time and place. Lifts in cars are almost always available although they cannot be absolutely guaranteed. Please offer your driver a fuel contribution of THB 100. …we moved on to the river in which, given the dry conditions, the water level had dropped a couple of feet from our last visit. One hiker struggled slightly on the steepest part of the ridge but soldiered on and we made it to the highest point on the hike in about one hour and thirty minutes. The Pm2.5 level had stayed depressingly high all the way up the ridge but declined rapidly to about 65 as we descended back to the river, allowing the removal of masks. At the waterfall one hiker decided to go in for a swim so we had our snack/lunch break there instead of the designated “beach” area (with the latter occupied by a small tour group). On the back part of the loop there was some depressing evidence of burning but, interestingly, for most of the rest of the hike the Pm2.5 level did not rise about 85. There were no elephants at the camp when we returned so we continued on with a small group of hikers, with the cars in sight, managing to take a convoluted route back to the end of the hike. The hike was just under 10 kms and, at a leisurely pace, took four hours and twenty minutes. Afterwards we stopped at the “Tower”restaurant, which during the week the owner had assured me would be open so was naturally closed, and had some refreshments and admired the view. Hike leadership and reporting by SRR. Photos by Michael M.
The Hike is ON. The latest AQI reading is “only” 165 which means, like on Wednesday, there is an excellent chance that the PM2.5 reading will be within safe limits. We will test the Pm2.5 level at the hike location but on these indicative AQI levels it will most probably be safe. This is a relatively easy hike of about 8kms with only 400m ascent on mainly good paths. 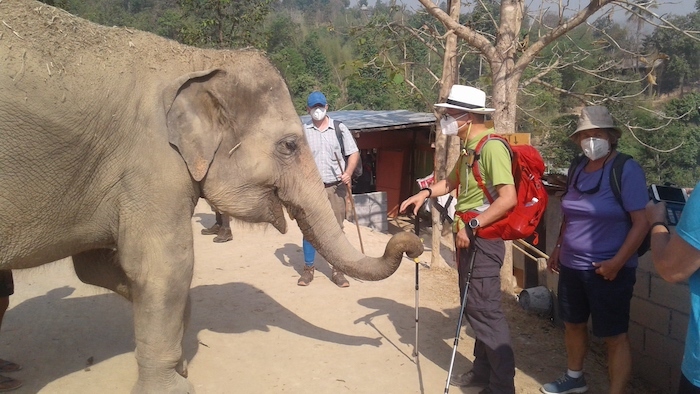 The hike will start close to the elephant camp and, if any are in residence, this may be a short feeding session before we move on. The first part of the hike meanders up from the river over mainly open farmland. 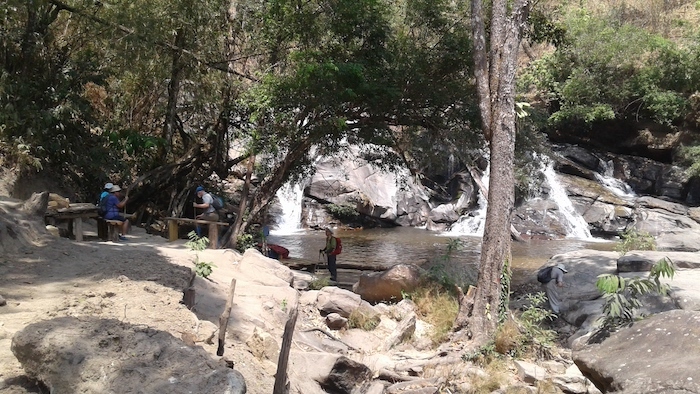 The second part takes us back down to the river and across, with a brief visit to the waterfall where some scenes from the 1980s film Rambo were reputedly filmed, and then back down along the river to the “beach” where we will have a snack break and some hikers may like to have a swim. Another forty minute walk along the river brings us back to the elephant camp at the end of the loop. The hike should take between four to five hours (including snack and swimming time) and afterwards we will retire to the “elevated” restaurant discovered by Mike on our last visit. We will meet at 07:20 for 07:30 start at the open area, just past the PTT gas station, when driving southwards on Canal Road from the Suthep Road intersection. The journey to the start point is 52kms and should take at least one hour. The hike is CANCELLED again, as the latest PM2.5 reading for Mae Wang is 192. It doesn’t seem worth even driving out there to check the conditions for ourselves. Try again next week! The hike is CANCELLED again, due to high levels of air pollution. This hike has been cancelled due to the hazardous air quality in Chiang Mai and the surrounding Districts. 11km long, 900m elevation gain and 6 hours expected hiking time. Up and down through forest, back along stream. Summit section open and offering magnificent views unless haze-obscured. Fairly steep sections up and down on forest trails with slippery leaves and very steep section involving scrambling and loose rocks just below the summit. Not suitable for people with a fear of heights. Very hot at this time of year, breeze may make it feel cooler, but will evaporate fluids faster. Sun screen, hats and above all plenty of water required. Air pollution has been very bad this last few weeks, but is somewhat improved today. Should conditions deteriorate again and the air quality become hazardous, this hike will be cancelled. Please check this site Sunday morning for an update. All hikers are responsible for their own safety at all times. No groups. Seats in cars can not be guaranteed. 1 hour drive each way between meeting point and hike start/end points. 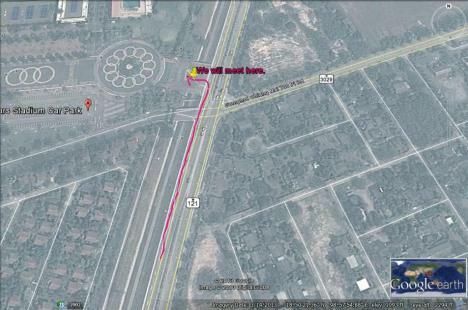 Meeting Point: in front of the SUSCO filling station on Highway 118 at 07.20 for a 07.30 departure. At least 2-3 liters of drinking water/ rehydration drink. Protection from sun, heat, smoky air. Energy snacks and picnic lunch. Strong footwear with deep tread/ good grip. Lots of energy, team spirit and good humour. Passengers please bring 100 Baht towards driver’s expenses and a change of shirt/ clothes. Cancelled this week! The latest Pm2.5 reading for Mae Wang is 197: a level which makes outdoor activities inadvisable. Hopefully this awful pollution will clear up next week.